Stretching from the Death Valley to Calexico, California's vast dry desert is home to a unique and important agriculture industry. It's a place where summertime temperatures often top the 115-degree mark. Where water supplies for irrigation depend on the Colorado River, but upriver states are claiming more of it. Where evapotrasporation – a reference rate of water use in unstressed turf grass – is 72 inches per year, but rainfall is rarely more than 4. Still, stalwart farmers grow dates, carrots, lettuce, broccoli, cabbage, kale and more, plus plants for landscaping everything from family homes to beautiful and luxurious resorts. The agriculture output of the state's three desert counties – Riverside, San Bernardino and Imperial – exceeds $4 billion annually. The California desert also impacts the quality of life across the nation. If Americans are enjoying a salad in the winter, the lettuce most likely was grown in the California desert. There are bountiful winter recreation opportunities available on the beautifully manicured golf courses, parks and landscapes. A group of UC Agriculture and Natural Resources (UC ANR) academics formed a desert workgroup to better serve the state's desert region. The group organized a symposium in February to bring together representatives from desert farm and natural resources communities, related industry and academics working in the desert. Director of UC Cooperative Extension in Imperial County, Oli Bachie, is chair of the UC ANR Desert Workgroup. “The close exchange of information among desert researchers, non-profit organizations, industry and clientele groups will facilitate collaboration among UC ANR, Arizona and Mexico and foster how our programs should be shaped on a regional level,” said Oli Bachie, the director of UC Cooperative Extension in Imperial County and the current workgroup chair. With saline soil, scorching summer temperatures and limited water supplies, the desert could be considered a hotbed of the “wicked problem.” A wicked problem isn't evil, said UC Associate Vice President Wendy Powers, the symposium's plenary session keynote speaker. She named climate change and the growth of the global population California must help feed as wicked problems faced by the state. Powers described UC ANR's statewide programs that are working to find solutions to formidable issues faced in California agriculture. 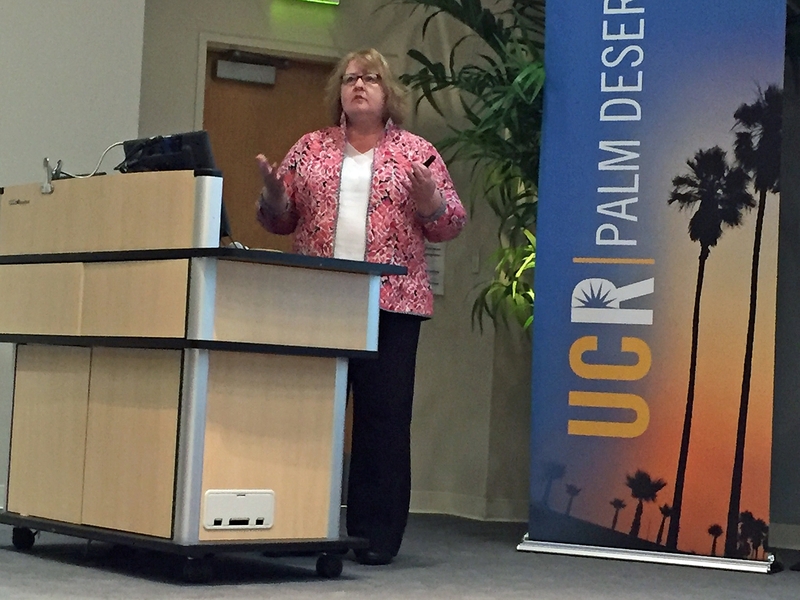 UC ANR Associate Vice President Wendy Powers was the symposium’s plenary session keynote speaker. UC Vice Provost Mark Bell said that the potential of UC ANR to reach every single Californian is what drew him to his position in 2017. Bell invoked Star Wars robot R2D2 for an acronym to reflect the characteristics that accurately define UC ANR. UC Cooperative Extension offices serve 57 California counties and its nine research and extension centers are located in key agriculture ecosystems, including one in the low desert of the Imperial Valley. The afternoon program of the symposium included breakout sessions to highlight programs and research efforts in three broad areas: irrigation and crop production, landscape management, and livestock and feed quality. The symposium had speakers and participants from UC, USDA, California Department of Food and Agriculture, the desert agricultural industry, pest control advisors, non-profit institutions and organizations, agricultural commissioners, farm bureaus, Arizona and Mexico universities and the general public. 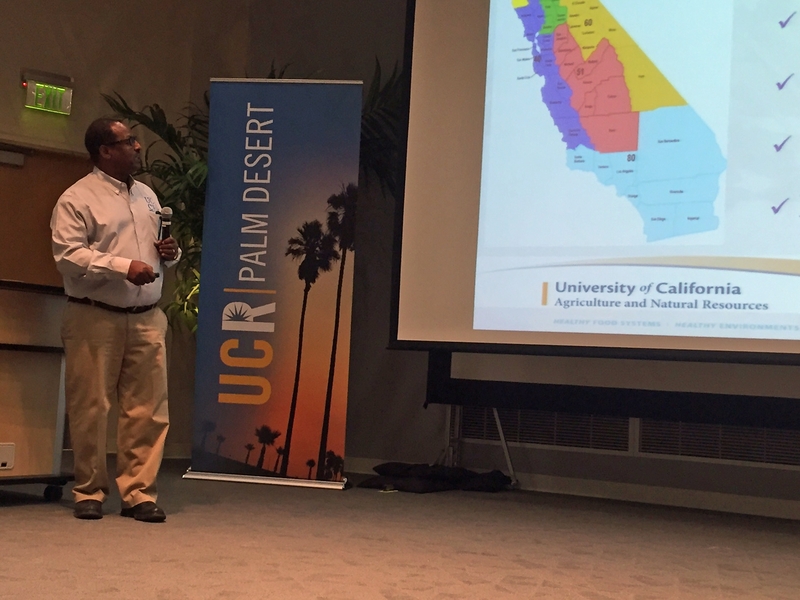 “I believe that the symposium is a stepping stone for future desert research and extension meetings, conferences and symposiums among people engaged or interested in desert agriculture and natural resources,” Bachie said. Israel has been pioneering the practice of modern agriculture in the desert. That's why most of the irrigation equipment used to come from there. When I still lived in Europe - long time ago - most of the interesting produce we could buy in winter (things other than roots, cabbage, potatoes and apples...) came from Israel. And it was surprisingly affordable. I imagine there is collaboration already amongst our agricultural scientists?